Brian's violin teacher called on Wednesday with an opening at 5:00. Brian and I had been at the barn, so we took showers to get cleaned up before heading to Salem. I instructed Brian to get dressed, and suggested he wear shorts since we've been having temps in the low 90s this week. He was so proud of the outfit he put together -- shorts AND all dressed up! The little-boy stereotype seems to be that you have to put them in a headlock to comb their hair, or lasso them with a tie to get them to wear one. 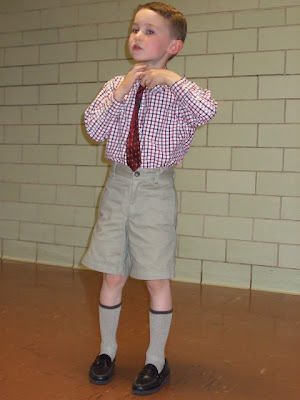 But my little guy is something of a clothes horse, and LIKES to get dressed up and look "pretty." 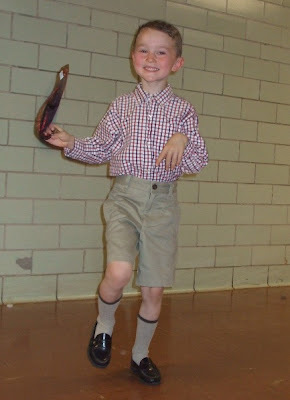 But he's still all boy, so after waiting on his teacher for a bit, the tie became a toy and the energy ramped up. When Brian does well in his lesson, we often stop for a treat. 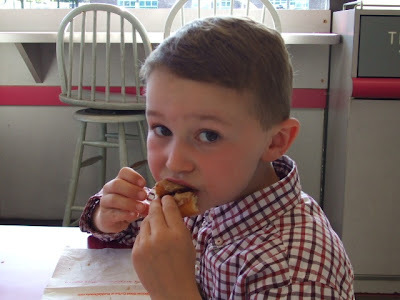 Fortuitously, there's a Dunkin' Donuts nearby that suits BOTH our tastes (it's a good thing he only takes weekly or bi-weekly lessons!). Ah, sweet reward! Make that four piggy sheepies! Here they are in the morning, running out to pasture for their morning "granola." Then they crowd around the hay feeder for some yummy orchard grass hay before expending the energy to browse their little pasture. Granted, they graze down what little herbage there is pretty fast (I would LOVE to have more of our pastures "sheep-fenced"), but they often "belly up to the bar" first even when the grass is more plentiful! As a result, they are all in good flesh, to say the least. Since I'm feeling a little "fluffy" myself, perhaps I should start haltering them and taking them on daily walks. It's a good uphill and downhill trek to our mailbox and back, with no loose dogs along the way. Of course, I could just feed them less, but then I would have to listen to their pitiful voices. 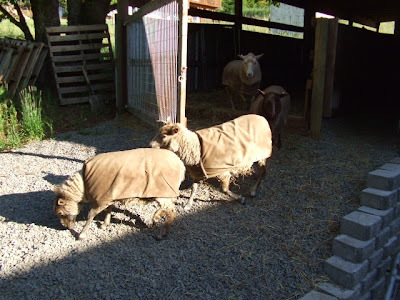 They ARE easy keepers, these Shetlands! Oh, one of my favorites is blooming now. 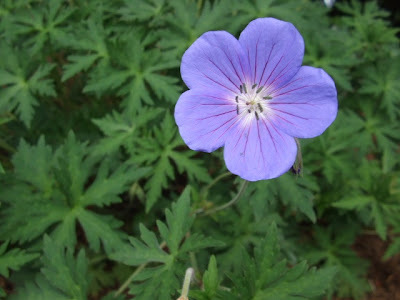 It's a species geranium of unknown variety that I picked up at a plant sale. 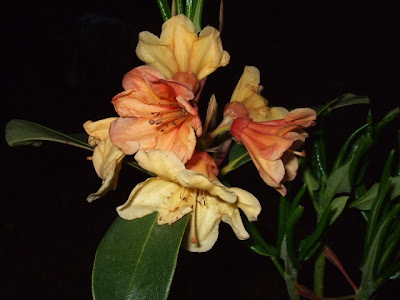 I like the plant's leaves, its habit, and the lovely color of its simple little blossoms. 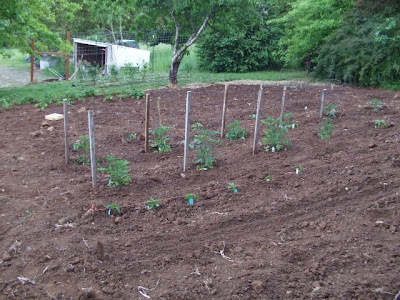 At the far end, beyond the potato plants and the Royal Ann cherry tree my husband refuses to remove, is Rick's berry patch. He planted eight raspberries this spring (one has mysteriously expired) and added more blueberries to the bushes he planted last year. 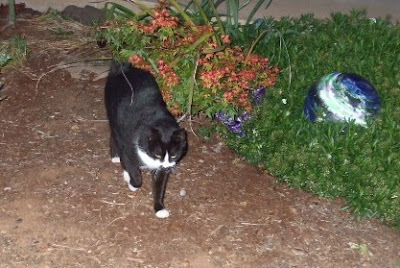 While I was taking these photos, Brian's Oreo cat showed up. She's a barn cat, but this holiday weekend she's come to the house several times. Hard to get a good photo of the friendly little thing! 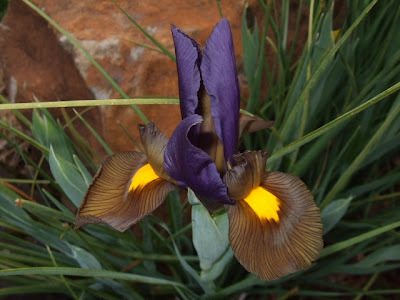 These are the Dutch (beardless) iris I have planted in a bed along our front walk. Tiger's Eye, they're called. Descriptive, huh? 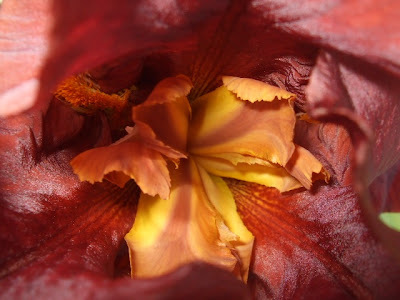 Not huge and frilly-fancy like the bearded iris, but quite striking in their own right. 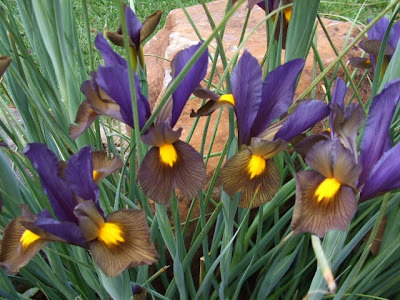 May is definitely the "iris month" here. 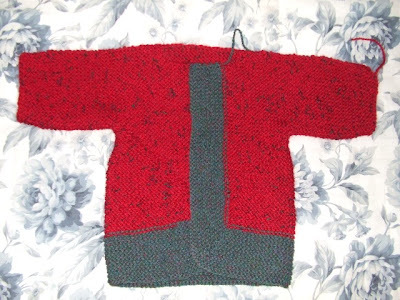 May is NOT really a sweater month, but here is my first Surprise Jacket, almost finished, nonetheless. (I still have to sew the top seams, put cuffs on the sleeves to make them long enough, and sew on buttons.) I didn't get much else done today besides getting this off the needles. Brian and I left with Rick for breakfast this morning, and didn't get home again until suppertime. (Rick is on emergency duty this holiday weekend, and getting "stuck" with him is always a chance we take when we ride along.) At least I thought to take along my knitting! Actually, the statement on a page of last year's Mary Engelbreit desk calendar was, "It takes a mighty good man to be better than none." True in both cases, I'd say. Yesterday I looked at rams and ram lambs that may be available to lease next fall. It was discouraging. The nice-looking lamb above is by a moorit fellow with fatal horns (his trimmed horns are a bit difficult to see in the picture below), and two other ram lambs are out of the fatal-horn ram's dam (and one of those has iffy-looking horns at less than three months of age). 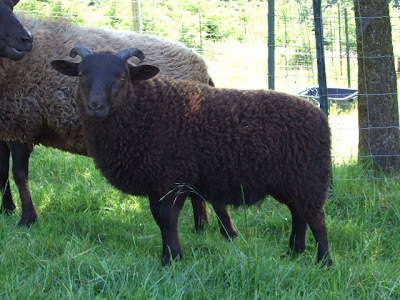 That left one very nice yearling of Lois' breeding (he's the guy at left below), but he's Ag and closely related to my nicest ewe. Sigh. I still have some other breeders to ask about leasing rams, and continue to consider buying my own ram. Horns are tricky. A Shetland breeder in Scotland keeps all his rams until at least two years of age to evaluate, as he's seen it take that long for horns to go bad, or straighten out. I have heard of very few North American breeders who consistently do that. As a result, there are a significant number of rams that are used before their horns can be accurately evaluated, thus sometimes perpetuating "bad horn genetics." I'm not innocent here. Last year I sold my ram lamb, iffy horns and all, to a lady who wanted a white ram for breeding and would take him with no horn guarantee. (His horns ARE still fine.) The more I've thought about this, the more I want to avoid that scenario in the future if at all possible. For me, that means not using a ram with bad horns, obviously, but also avoiding a ram with bad horns in his background. (Those sneaky genes have a way of popping up down the line.) So I will keep looking for "Mr. Right" for my girls, one that has the best combination of fleece, conformation, good horns/absence of horns, and attitude that I can find and afford. What if I can't find him or can't afford him if I do find him? Please refer to title. Yesterday Lauren "tagged" me. At first blog glance (I was instructed to go to her blog to get the rules and find out what in the world this is about) I was going to pass, but by the time I read through her five random facts and learned some new things about my already-fascinating cyber-friend, I decided to play. Here are the rules: Each person tagged gives 5 random facts about themselves. Those tagged need to write in their blogs 5 facts, as well as the rules of the game. You need to tag 5 others and list their names on your blog. You have to leave a note in the comments of the blogs of those you plan on tagging so they know that they have been tagged and need to read your blog. 2. From early grade school through college I wouldn't tell anyone my middle name or initial (R. for Rose), because one of the biggest insults another child could give you then was to say, "You're an M.R." (for Mental Retard). 3. I attended an eight-grade, one-room school for 7th and 8th grade. 5. Like Lauren, I'm a "former" stained glass artist (no restoration, though) and still have all my equipment and an unopened 200 lb. crate (!) of stained glass that I can't bring myself to part with. Some day . . . some year . . . some lifetime . . . .
Back to sheep posting next! 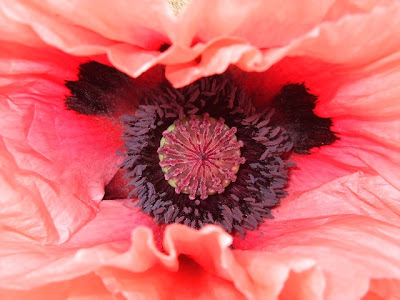 My husband doesn't get my fascination with close-ups. I love form, color and pattern (although, strangely enough, Georgia O'Keefe's paintings don't do much for me). 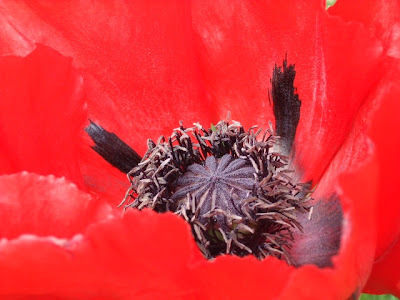 I never could afford a macro lens for my 35mm (anyone else have a Pentax K1000 from college photography class? Great little workhorse with auto-nothing....), so I just LOVE my cheap little digital camera. Like it or not, here is a glimpse of "my way of looking at things." 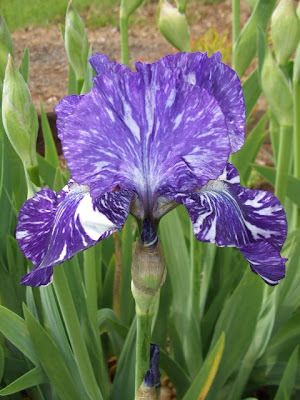 I think of May in the Willamette Valley as the iris month. 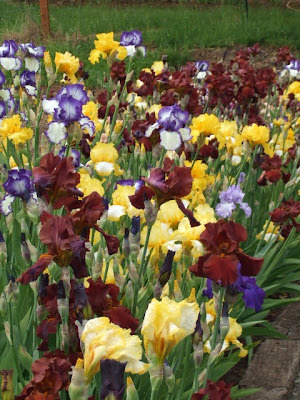 Our own iris bed, a long, narrow crescent along the circle drive, is really doing well its second year (shown here before peak bloom). 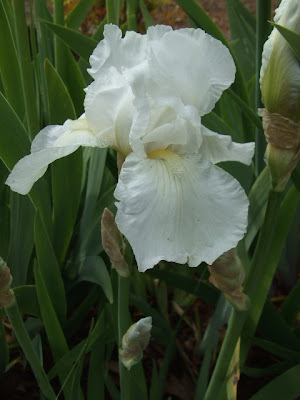 Most of the bulbs were given to us by a neighbor, but I did buy three new varieties last year: a white whose name I can't remember (because I had none) "Batik" (because it's long caught my eye) and "Mohr Pretender" (because Mohr is my maiden name). 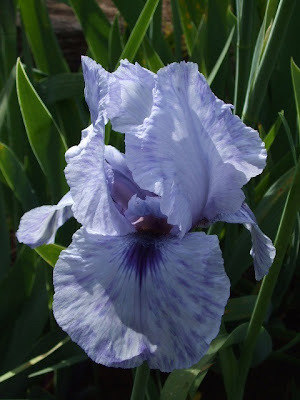 I bought my new iris from Schreiner's, which is the largest commercial iris grower in the U.S. Schreiner's also maintains the most gorgeous display gardens at their headquarters, located not too far from us. 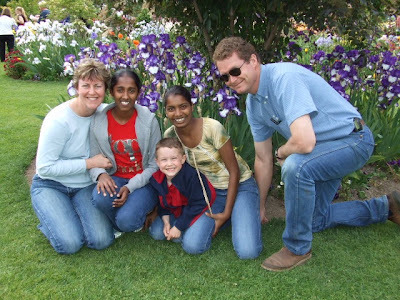 Nearly every year we've lived here we've made a pilgrimage to see the gardens, introducing others to the sight whenever we can. 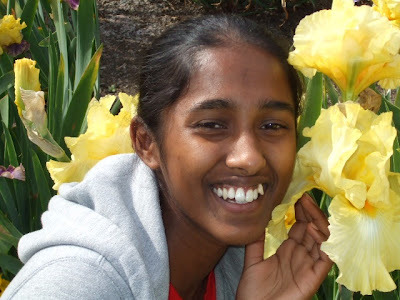 Yesterday we took Nileshni and Karishma, who are staying with us again while my friend is in Fiji. 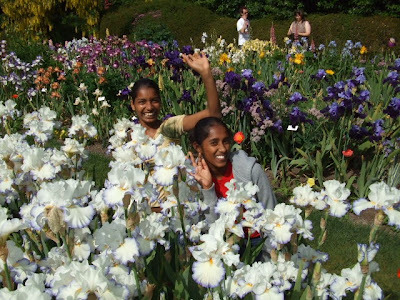 They were predictably captivated, and I had fun photographing them enjoying the flowers. It was the perfect day for it, too, with hazy bright conditions. When taking the responsibility for propagating any kind of animals, I believe one should be willing to make tough decisions. My husband, a horse vet, and I, an active rider, trainer and competitor, have groaned and rolled our eyes untold times over someone saying of a particularly nasty mare, "We should just breed her; it might settle her down." I'm a firm believer in the saying, "Good stallion, better gelding." We've raised two litters of bulldogs, and took pride in the fact that we weren't breeding for show quality, but for healthy, long-lived individuals all too rare in this often-problematic breed. 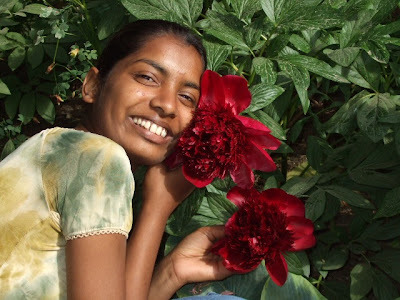 Then we took great pains to place them in suitable homes. After all, according to scripture, we are only stewards of all we have, not really owners. 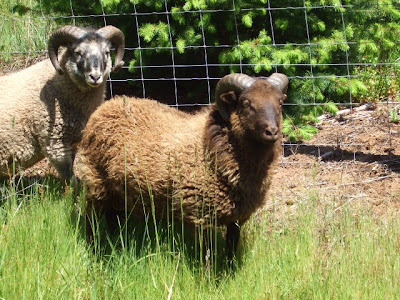 Enter Shetland sheep, by way of Oregon's interesting property tax laws. 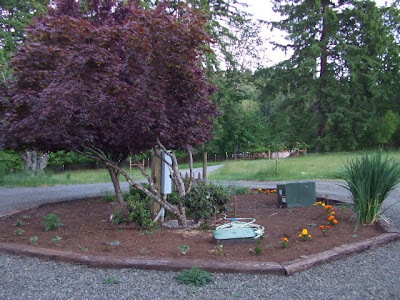 When we purchased our small acreage in 1995, it was already in "farm deferral." In other words, the property tax rate was greatly reduced because the previous owner was claiming to use it for legitimate agricultural use. If we would rather not bother with agricultural use of some kind, we could switch to the regular residential tax rate -- but only if we paid the difference between the two rates for the last five or seven years, which would add up to thousands! Obviously, it was in our best financial interest to keep the property in farm deferral. So, what to do with it? Our horses didn't qualify, unless we were selling them or boarding others. (I did sell two in 2002 in part to help finance the construction of our new home. If the total sales prices could be spread out, it would satisfy the annual income requirement for our farm deferral for the next 70+ years, but it apparently can't be done that way.) We bought and sold feeder calves a couple years, in part so my husband could "play" with them on his cutting horse, but aren't set up properly to keep them here at home. Besides, I don't like a project that is expressly about buying and selling an animal for slaughter when I am a vegetarian! (Not that I think eating meat is "wrong," necessarily; I just figure that if the original diet given in the Garden of Eden was plant-based, and the diet we will eat in heaven is plant-based, I might as well enjoy the diet of a perfect world now!) 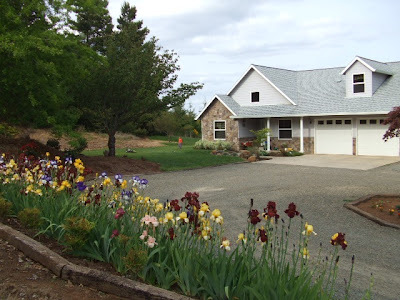 So the quest was on for the "perfect" farm deferral project: one that wouldn't take significant pasturage from our horses, one that produced a product we are comfortable with, one that could provide the modest required annual income on our small acreage, and last, but certainly not least, one that I enjoyed. 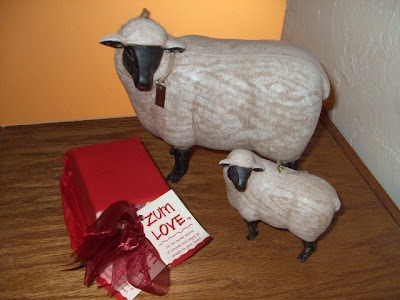 To me Shetland sheep seemed the perfect answer, and still do. 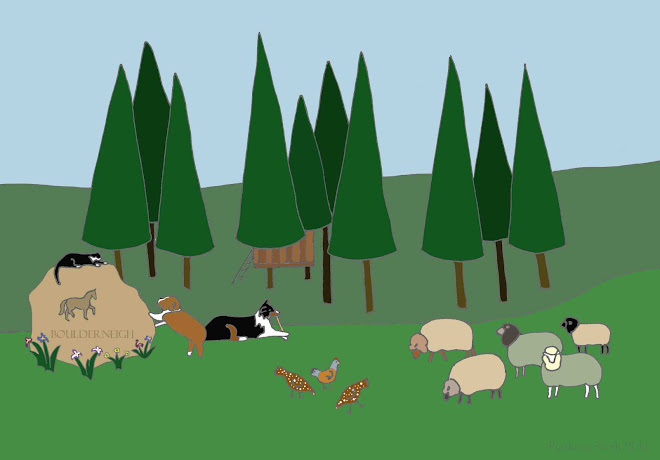 I can sell quality individuals as breeding stock, and the rest as fiber pets and/or lawnmowers. 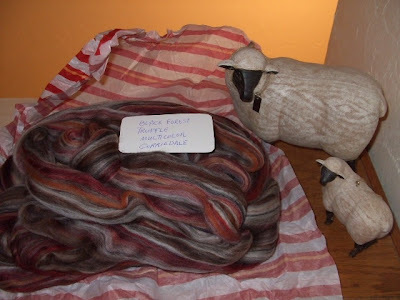 I can sell their fleeces, and even handspun yarn. Granted, all of the above doesn't happen on its own. 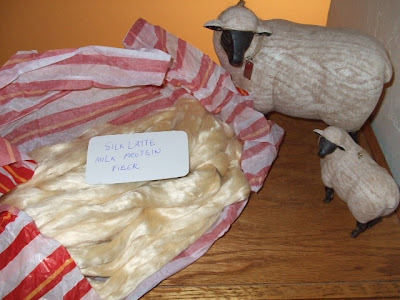 You must provide feed and care, make the best breeding decisions you can, market/advertise/show your stock and fleeces, and prep and spin the fiber to sell handspun. The payoff? These wonderfully personable little creatures who are a delight to the eye and hand allow us to keep our property on farm deferral. I am new at this, with less than a year and a half of actual shepherding under my belt. What if I find that my careful little plan doesn't work? What if I end up with sheep I can't sell, or males that are dangerous? Yes, I have considered these things -- I am known for overanalyzing, not the opposite! For me, sending "culls" to auction is not an option. I know too much to be able to send any but the most ill-tempered and dangerous animal to its death in that way. 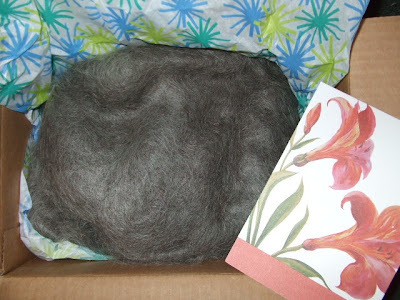 (Besides, I am fairly confident that I could find a home for a $25 fiber pet or lawnmower, which is all most expect to get for a Shetland sent to auction around here.) I might consider using the mobile butchering service as a last resort and then selling the meat, knowing that the animal wouldn't be stressed, mistreated or worse in its final days/moments. I owe them that. We'll see how it all works out. I have my four girls, the number I've settled on as just right for Boulderneigh. I might do some changing of ewes, but the number will stay at four. I am considering the purchase of a ram, if I can't find a source of quality rams to lease. Check with me in another year or two to see how my plan is working. I hope to have good things to report. 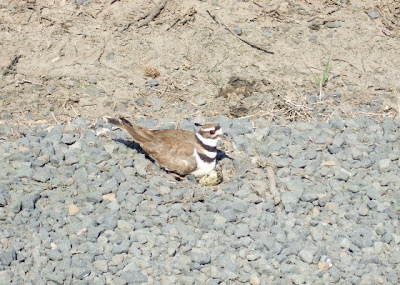 This morning I was driving to the stable to ride a horse for someone and talking on the phone with my dear friend and mentor Lois about shepherd dilemmas (more in a coming post) when I spotted two killdeer on the gravel road. One was standing and the other was sitting -- or rather, setting. I mentioned the ill-chosen nesting site to Lois, and she said what had already crossed my mind; "I'd move the eggs." Chances were, if I did, the birds would abandon their incubating offspring, but the chances of said offspring surviving their parents' choice of birthing suites were slim to none anyway. So I backed up, snapped the above photo, and then carefully moved the three eggs to the edge of the field on the other side of the ditch, using a tissue to avoid leaving my scent on them. 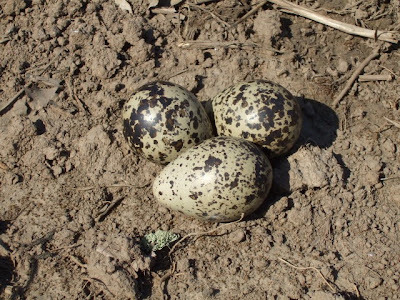 When I passed by the site on my way home, the eggs were untended, abandoned or perhaps never found by the pair of killdeer. I felt sad, second-guessing my actions. It was a true dilemma, a "damned if I do, damned if I don't" situation. Life and death: something God never intended his creatures to know about. 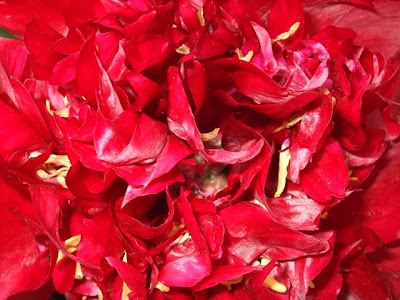 When it came to the Tree of the Knowledge of Good and Evil, ignorance would have been bliss. and some silky-shiny Silk Latte milk protein fiber that probably COULD be eaten -- all beautifully wrapped in colorful tissue. Wow! A huge thank-you to Arianie for holding this contest and giving the generous prizes (as well as the wonderful specials on her website). I can hardly wait to shower -- and spin! Who knows! 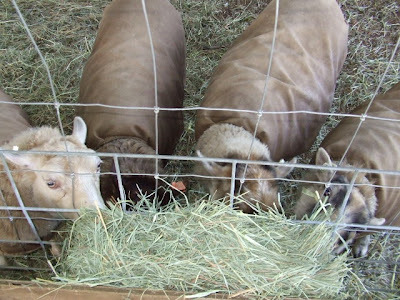 But it sure was fun to watch the lamb races at Franna Pitt's EverRanch last Sunday morning -- I think it was the highlight of our visit (no slight intended to all the other aspects, Franna!). With only one lambing season with two ewes under my shepherd's belt, I've never gotten to see a whole pack of tiny, exuberant lambs racing first one way, then the other, until they are mouth-open panting. 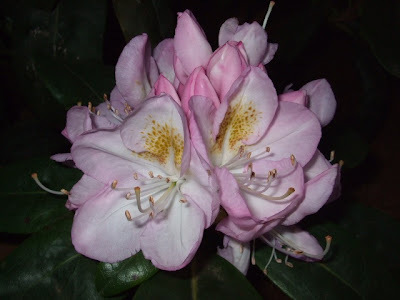 It was a delight beyond words . . . . 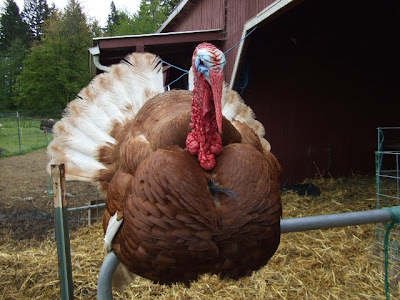 But there were many other enjoyable aspects to our farm visit, not the least of which was this handsome tom turkey. His hens were off sitting on eggs, so he had nothing better to do than sit here and gobble. The main reason for visiting Franna, however - besides picking up the fleeces that didn't sell at Shepherds Extravaganza - was to see BOYS. 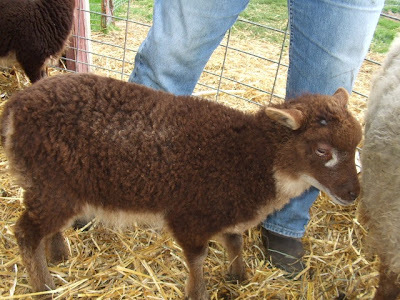 Franna has ram lambs for sale (of course), but also has a proven ram that she might consider leasing if he doesn't sell. I went to see and, more importantly, FEEL this prospective flock sire. Of course, the chance to examine several little boys to hone my eye and hand was most welcome, too. After adamantly stating that Boulderneigh will always be a "ram-free zone," I hate to admit that I am tempted to purchase one. I think the gulmoget pattern in Shetlands is striking, and Franna had THREE born this year - a ewe and two rams. 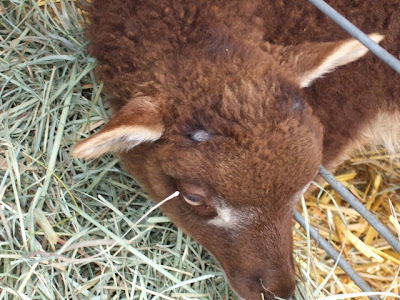 Both ram lambs had the possibility of being polled, but only one is showing evidence of carrying a polled gene by having tiny little scurs instead of the typical prominent horn growth. This is the one who could persuade me. We'll see how things work out. Too many subjects, not enough time!